Browse: Home / Featured / Children Of A Lesser Charge. What happens when there is an increased loss of positrons leading to an imminent and irreversible system failure? If detected in time and have received a divine spark to get off the alkaline, there is AA recharging transformer stations placed in strategic locations. Is it an open meeting? 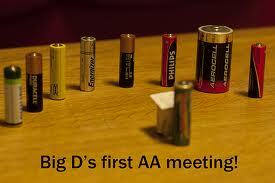 Can AAA batteries attend? Of course they can, but there will be a slight charge. Oh good, I need a good charge, Wait, do you take plastic? Ohm, there is a significant Resistance to charging unless there is amp pull ability to send a steady stream through a bank of wires. No, but he does have a bi-polarity with a switcho Schizo disorder. Won’t he need to lose his Brand, if he stays there? Not if he stays EverReady and dose not travel Interstate. Did they bring him to energize the group, then? It made them hop, skip and a then but a simple cable jump of additional cadmium insures against a premature armature discharge. We flow with a singularity of polarity although they too can find a trickle with a positive post of plated nickel. Double D’s are considered a form of royalty as it creates an ark from a laser focused spot on a place marked by the indentation of separation. 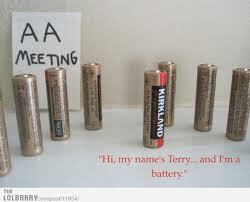 Does it work for all batteries regardless of their condition? We have found that if there remains the smallest amount of spark and can fit into their assigned slot (in either a series or in a parallel circuit) an ark will generate a maximum parallax effect if so inclined will produce a source of light negating the dark. Does the discharging battery have a natural opposite pole attraction, for renewal and possible survival or does the fully charged battery take the lead in acquisition and this in order to maintain their own needed capacity? Both, as circuit stance and happenstance as the utility of the electron flow is wired to one main power source with several printed circuit boards with multiple connectors accommodating both AC and DC fields, thereby creating an unlimited interface of possibilities. How is this renewal to a former utility and the extension of a reliable uninterrupted service accomplished? With the introduction of a 12M Step up transformer to replace medium to low voltage generators the power becomes exponential and is of a degree not previously imagined nor conceived. Recharge 3 xs per week S.O.P. for Minimal efficiency, Max shelf life guaranteed in the full recharging jumper stream modality, passing on the previously acquired energy while upgrading from a limited to an expanding capacity to remain grounded. Rarely have we seen a battery fail when connected to the voltage of a higher power that insures the immunity of corrosion with an unlimited warranty of a fully charged life of extended service.